The T.E.A.M. 4-H Club is active in the community, they have done such service projects as making May Day Baskets for the elderly at the nursing home, they have can collectors at the Dodge County Fair to try to help keep the fairgrounds clean. The T.E.A.M. 4-H Club has also promoted 4-H by having the kids decorate local businesses windows with posters for the year’s theme. All the kids in the club, as well as the parents, are always willing to help anyone in the club, or in anyone else. They devote time and energy to help the Dodge County and Fremont 4-H fairs go off without a hitch. The kids help stock the bathrooms with the proper necessities, the parents help run the different animal shows, and both kids and parents help check-in exhibits and decorate the club booth. Everyone works as a team. That’s why T.E.A.M 4-H is October’s club of the month. The Nebraska 4-H Foundation and Nebraska 4-H Ambassadors are proud to call the T.E.A.M. 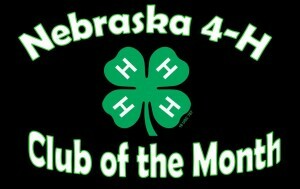 4-H Club of the Month for October 2013. No Comments to "The T.E.A.M. – October 2013 Club of the Month"